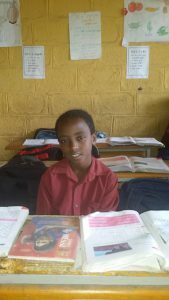 Halid is a 9 year old student who is now attending grade 3 classes and is a promising boy of Fregenet Kidan Lehitsanat School. Halid was born and raised in Cherkose: Kirkos sub-city, Addis Ababa, Ethiopia. Cherkose is one of the most deprived neighborhoods in the city of Addis Ababa. Here you can find a great number of children who do not get the opportunity of education for many reasons. There are many who don’t have enough to eat, adequate shelter, or even decent clothes to wear. On top of this, many of the children of Cherkose have lost their parents for various reasons and live with their relatives and grandparents. This is the case with most Fregenet Kidan Lehitsanat School students. Halid explains that making it through your education and being a success has always been hard in a neighborhood like his where the number of youths without jobs is high and where young men spend their days chewing chat, smoking, and drinking in broad daylight. It’s hard to find even one who has succeeded with their education. Halid wants to make this situation history once and for all by becoming successful and achieving his dream of becoming an airplane pilot. He wants to be a role model for the children in his community. Beyond his dream, Halid has a strong desire to change his family’s life. He wants to bring his father and brother to Addis to live nearby. He also wants to engage in humanitarian activities to help change the life of youths in his neighborhood. 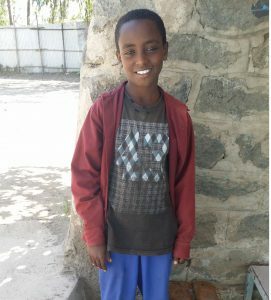 Fregenet Kidan Lehitsanat School is a place where a great number of children like Halid get a chance at a valuable education fully supported by meals, health care service, a school uniform, education materials and text books. When there is no one who can look after these young ones to fulfill their basic needs, Fregenet Kidan Lehitsanat has been the hope and the dream of a better tomorrow.